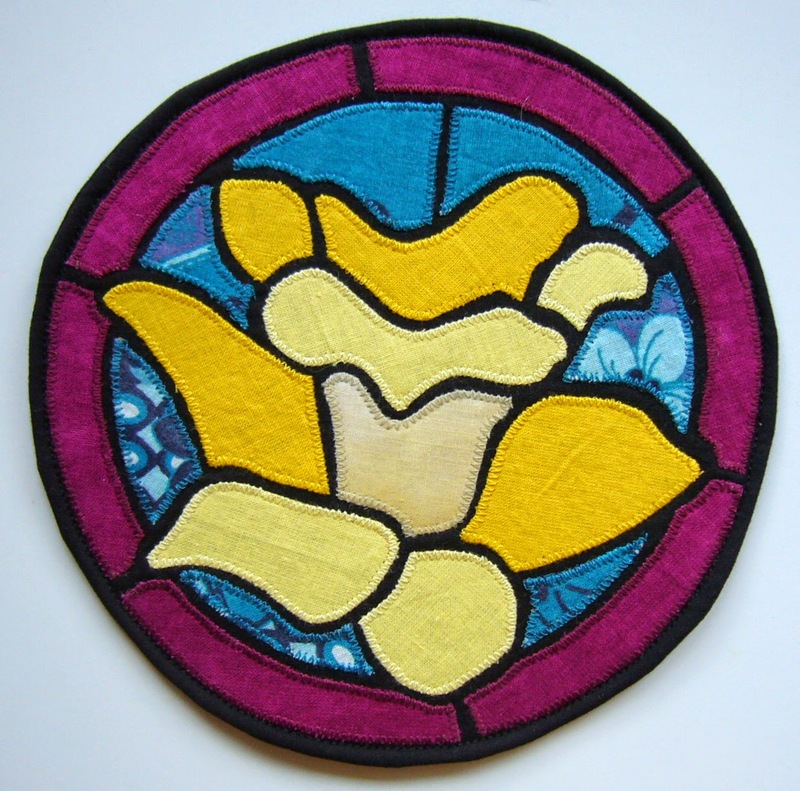 I have designed a daffodil stained glass picture and realized that binding it usual way with bias tape won't look pretty. I wondered what fabric to choose, thought a little more and decided to make it as cushion cover - place top and back right sides together, stitch and turn over. 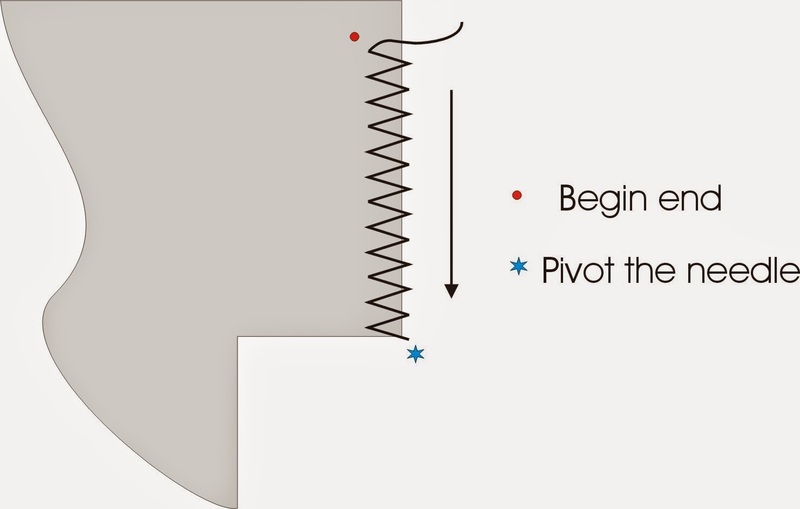 The difference is that instead of leaving a hole for turn over when stitching along the perimeter, you have to stitch WHOLE perimeter and make a slash on the back for turn over. This ensure you have a perfect circle shape. I have seen this method on the Lisa Call's site - an interesting fiber artist I have found two years ago. 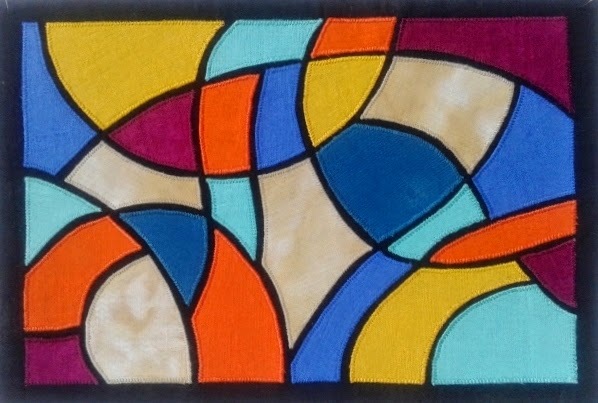 In fact she made ACEO mini quilt - they are small rectangles 2.5″ x 3.5″only, but the idea is the same. You will need 7" circle batting , 7" circle backing, 3"x1" strip non-woven fusible interfacing and finished top. Make your own or get the pattern from HERE. of the picture to fasten two layers. 2. Fuse a strip of fusible interfacing on the wrong side of backing and cut a 2.5” slash. 3. Lay the backing right side up and place on it the prepared top from step 12 right side down. Stitch round perimeter follow the seam you made earlier to fasten batting and top. 4. Trim the batting only close to the seam. 5. 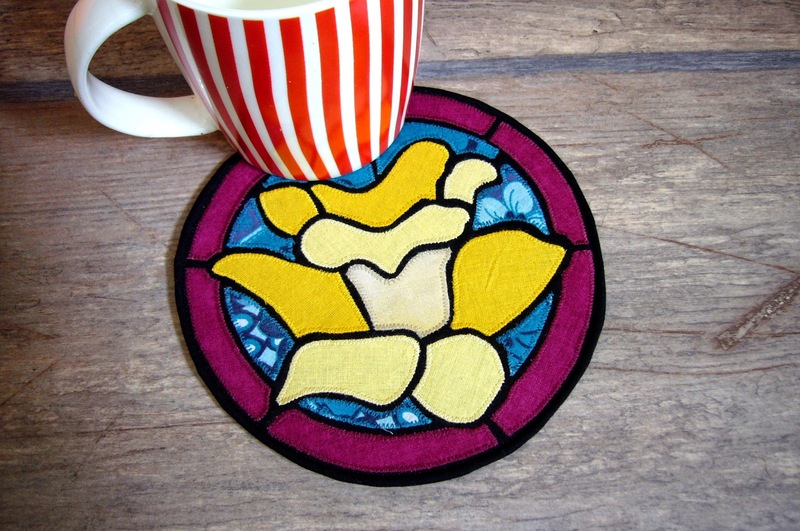 Turn over the mug rug through the slash you have cut on the back. Iron well, stitch round close to the edge. a strip to hide the hole. 6. 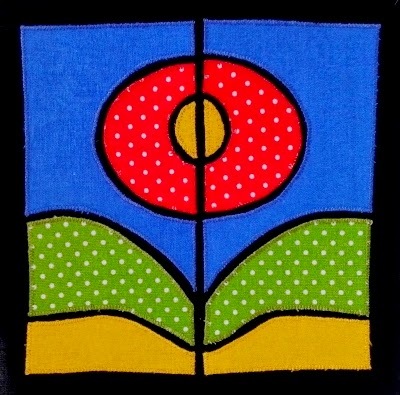 Now you have a perfect circle mug rug. Make a cup of coffee or tea and enjoy the spring. 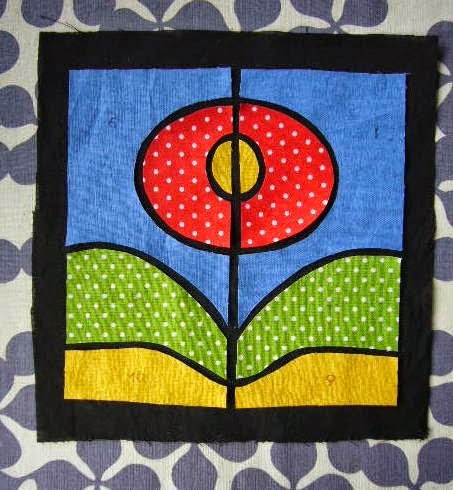 Do you wander how quilters make perfect appliqued shapes? Are you dreaming about beautiful zig zag stitches around every detail? 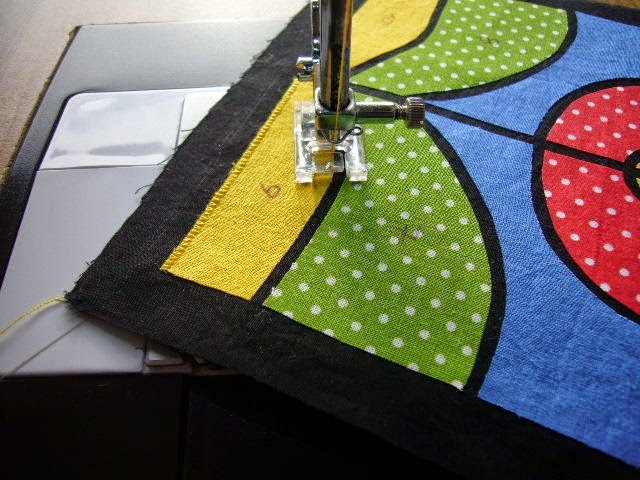 The secrets of good looking applique stitches are several. 1. 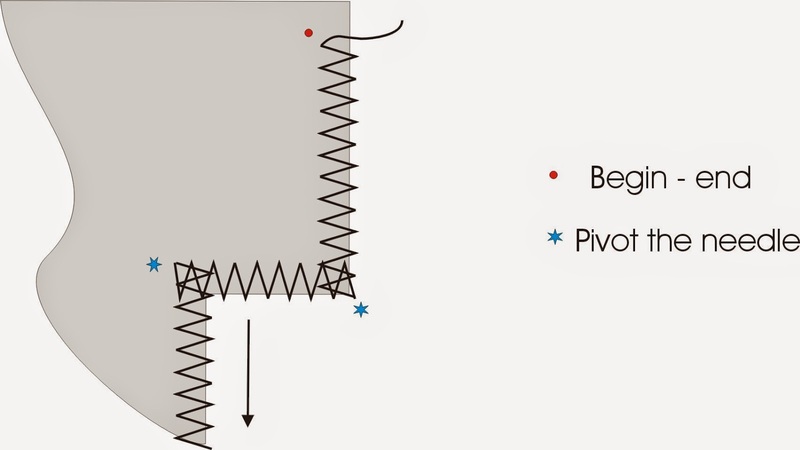 The foundation fabric should be stabilized. Use paper stabilizer of fusible non-woven interfacing. 2.Set your machine at medium to lower speed. 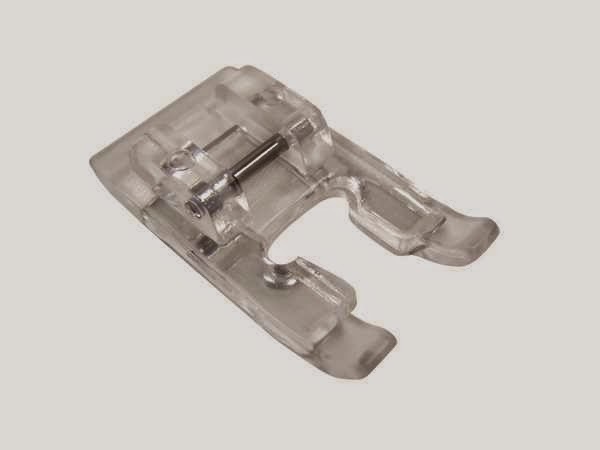 This allow you to control the up-down movement of the needle when you reach the place where have to change sewing direction. 3. 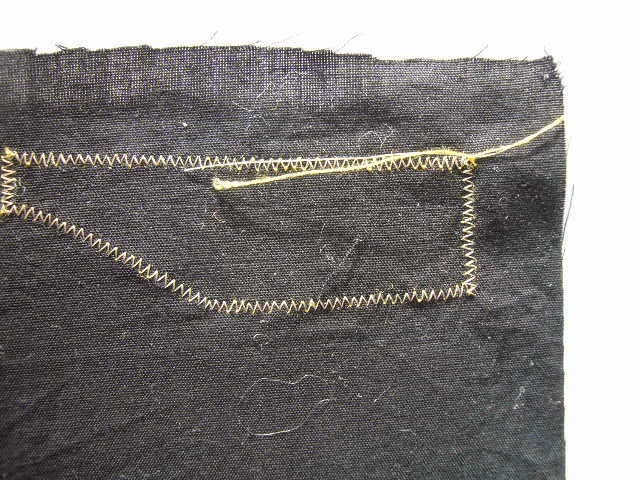 Set the stitch length to 1.0 and stitch width to 2.0 and test how it looks. Usually this works. It gives you bigger field of vision. 5. Begin stitching. At the end of the edge at * put the needle in the background fabric, lift the presser foot and pivot. 8. 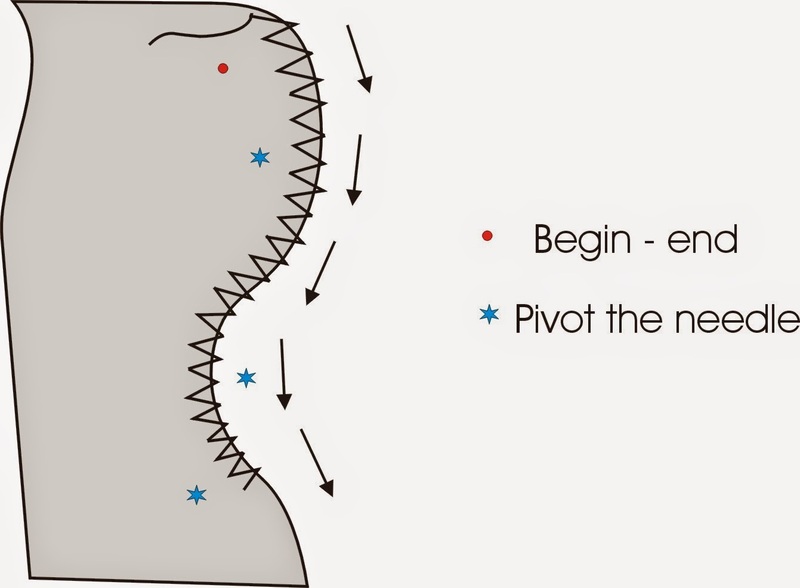 When stitch the curve select low speed and pivot inside the curve. 9. 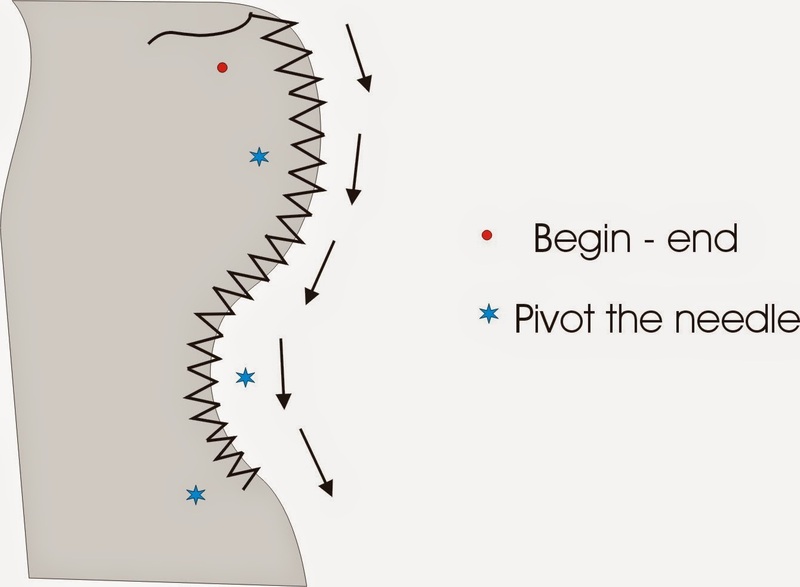 When reach the beginning stop at the same point, pull the threads at the back side and make a knot. 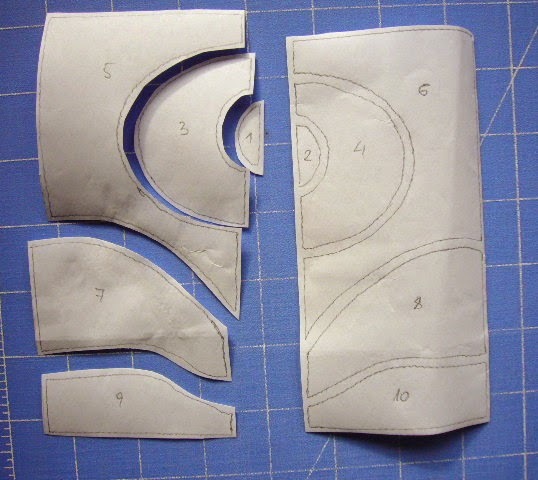 Finding tester to sew my paper pieced designed diagrams looked very easy after a post in Facebook on my wall. I wanted to find three testers for three of my patterns and published them here non late than 3/03. They have to make block with fabric from their own stash and send me a picture. I was curious to see how quilters use different fabrics. It sounds interesting, is it? Some of them were so quick, some of them meet the deadline and some don't send me anything. It was a funny time, I found new friends and met human diversity. First group - Coffee grinder paper pieced block. Karol has sewn two versions and both look beautiful. 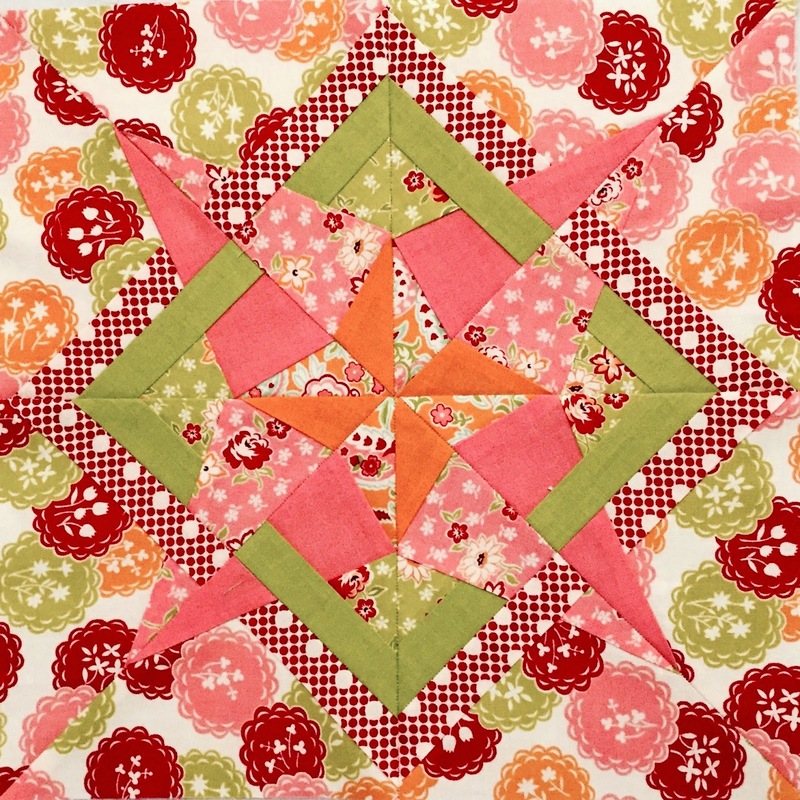 Second group - Ribbon Star block paper pieced Block. 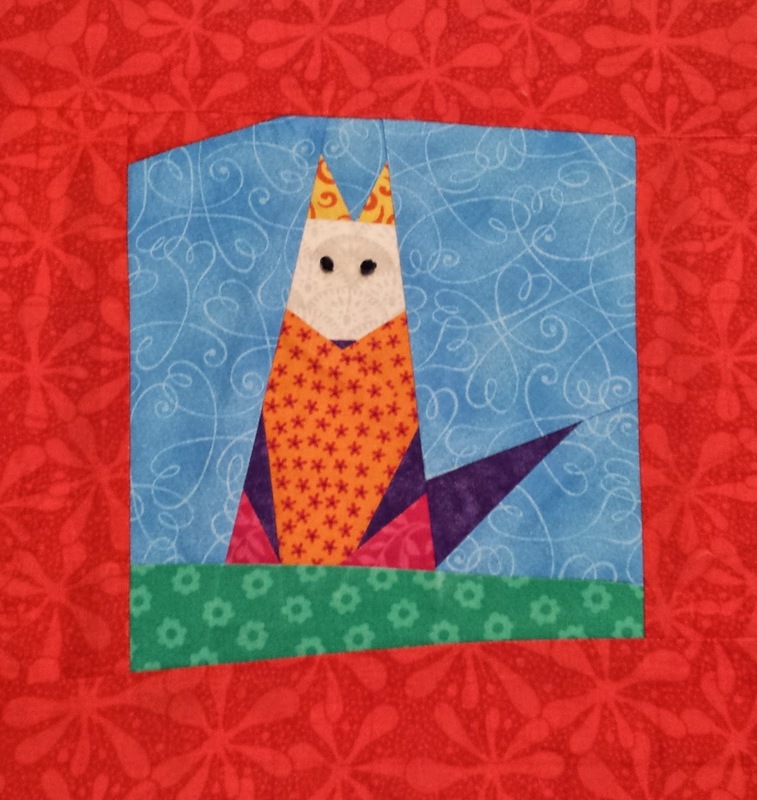 The third group - Fox paper pieced pattern. 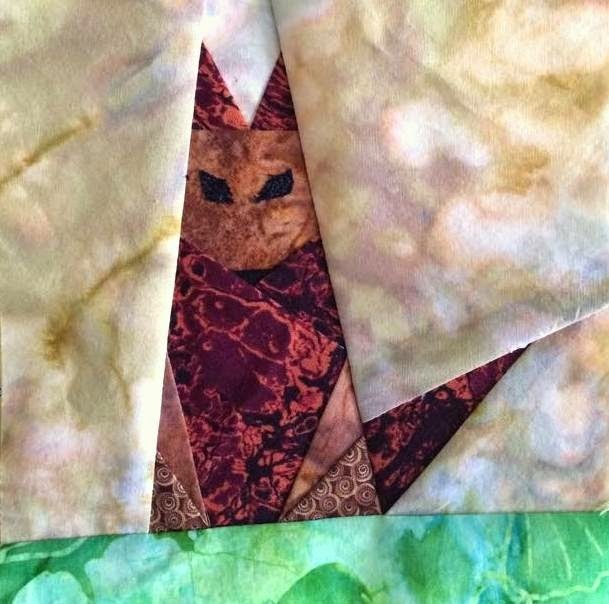 Ammy has sewn this cute fox. The patterns are available at ETSY and CRAFTSY. 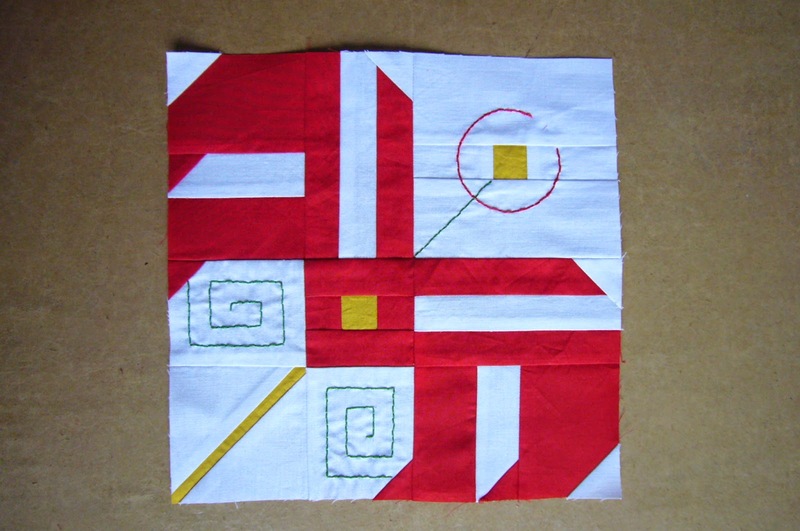 Feel free to add picture of sewn blocks by my design at my Flickr group HERE or sent them to me by e-mail. When the site Quilt around the world announced their project Where do you come from last Summer I have no doubt I have to participate in. They have been looking for patterns, ornaments, symbols, and grafical structures from all over the world, interpreted freely and translated into fabric as Patchwork and Quilting Pattern. My paper pieced block Ethno totem was perfect for this idea. 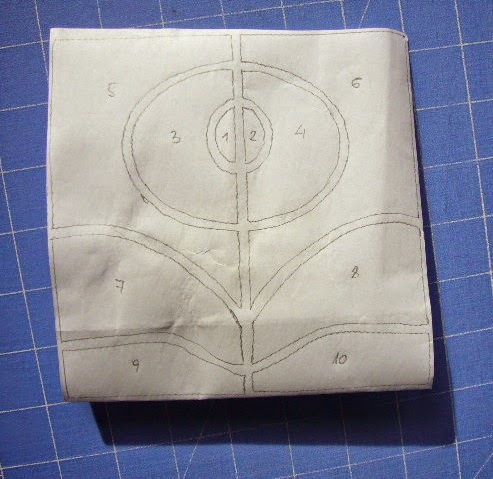 I was inspired by national embroidery when designed this block for cushion's cover. There were requirements about the size of the blocks (to make collecting easier) so I have to adjust the size. I sewn the block, wrote a story behind , filled the registration form and sent to Germany. When received a special mail with kind grateful words I was happy. Here are the participants with their blocks and stories - about 70 quilters from 20 countries. Look how the blocks were gathered by EQ7. Don't you think it would be a great quilt, do you? 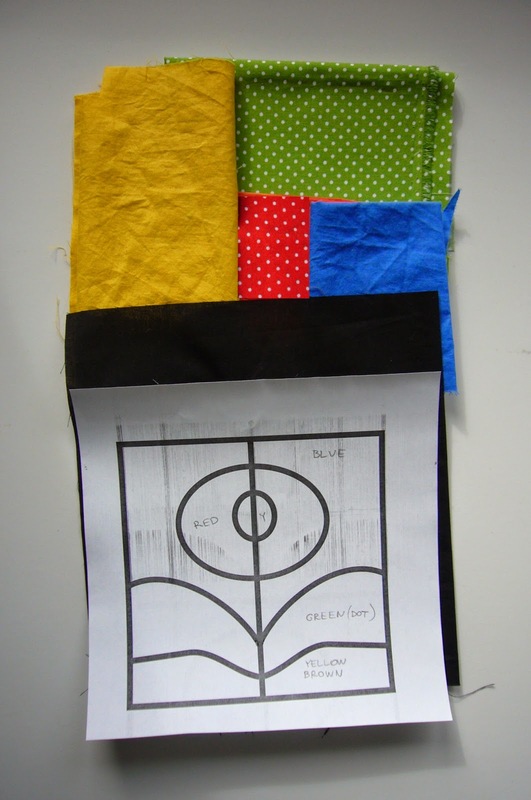 Now the will sew together all blocks and print a book with participants. Can't wait to see all together in a real quilt. P.S. I was amazed yesterday when found another interesting inspiration like my embroidery (tapestry) one on the site Upper Case magazine when reading news about Quilt Con 2015 . Look at the sound weaving. After some attempts with easy shapes I decided to make more complicated picture as stained glass. Because Easter is round the corner it is obviously I aimed my efforts to this scenario. 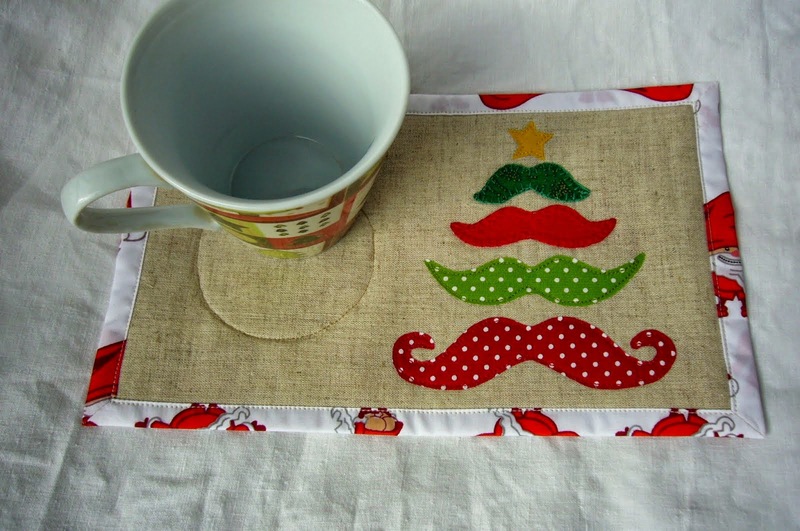 I have appliqued the same way - look at the tutorial HERE. The only possible quilting would be stitch in the black. Anyway I don't want to touch beauty of black stripes with thread stitching. I quilted the backing and batting first. Then place this sandwich right side down and place the finished top on. Stitch round the perimeter at a quarter inch from the edge of the picture and trim to 3/8 inches from the edge. Then add binding as usual. Grab the pattern from CRAFTSY or ETSY. 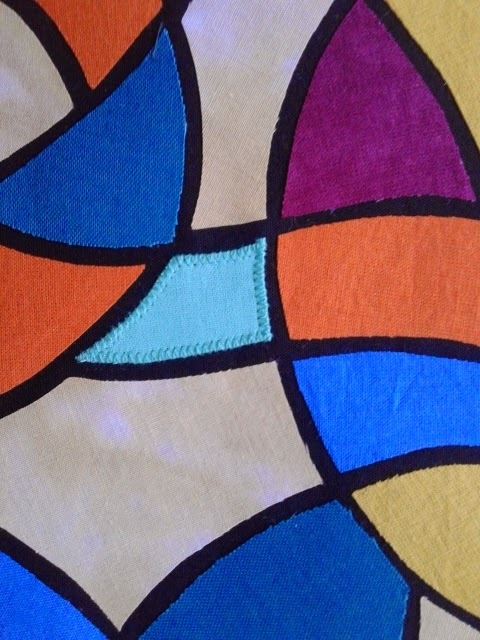 I have chosen pastel fabrics, but think more vivid colors would give a better look! There are so many different items - from classical windows and doors to quilts. 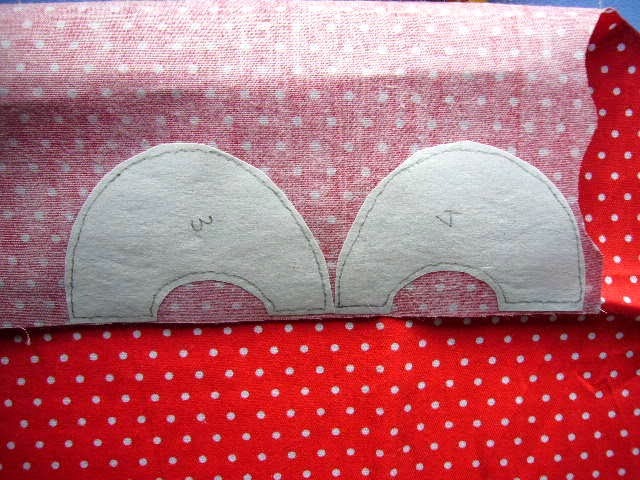 Usually when sewing it is used a narrow bias strip to separate different pieces. This is 100% sewn by hand and for someone who doesn't like hand stitching it is so boring. 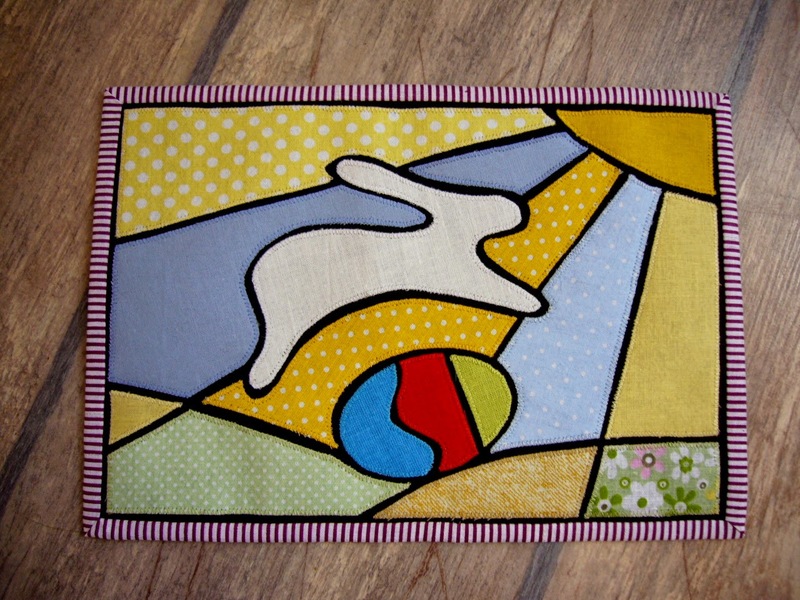 If you like to applique by machine this stained glass method is perfect for you. The finished block is 6 inches. And a diagram, of course. 1. Choose the fabrics and write down colors on the printed diagram. 2. Transfer the MIRROR image of diagram to the double sided fusible web. There is no need to print a mirror image, simply turn the printed diagram before stick on. I usually stick on the window to use the daylight. Be sure you transferred correctly all the numbers. 3. Cut round each piece. Pay attention to cut between every two pieces. 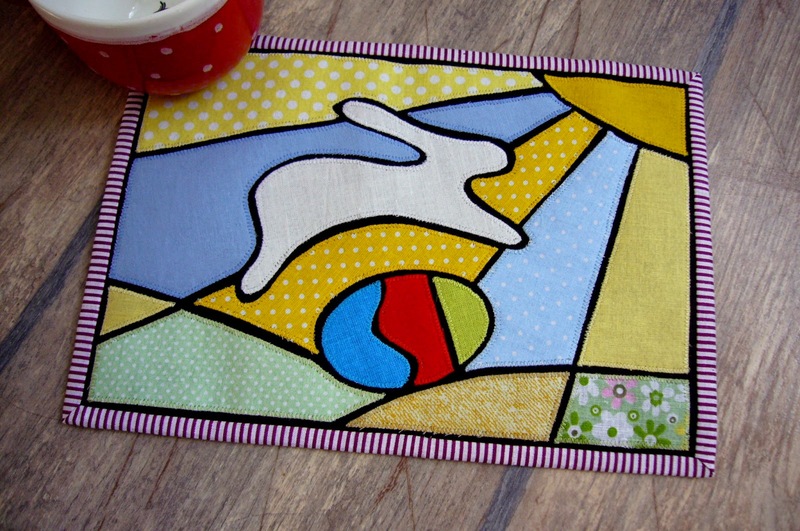 This ensure a little allowance to make fusing onto the fabric easier. 4. Fuse all pieces onto the back of the selected fabric with a hot, dry iron. 5. Trim each piece along the line. 6. 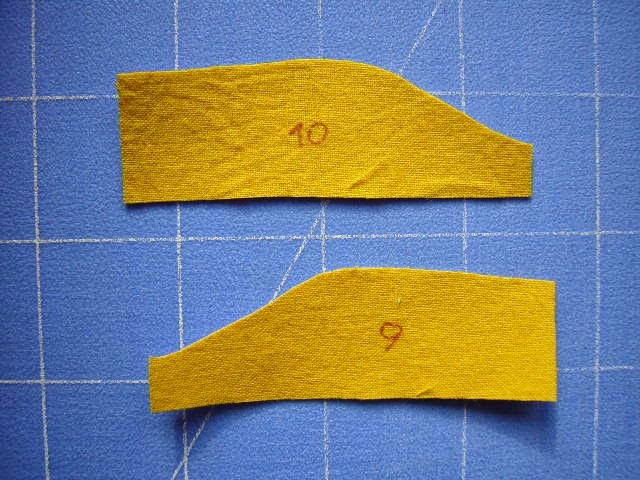 Transfer the number from back to the front of the fabric with disappearing pen. Tip: place each piece on the corresponding place onto the printed diagram - for instance number 1 on the number 1. This will help you later when have to peel the paper and order on the black fabric. 7. Fuse the non-woven fusible interfacing onto the back of the black fabric with a hot, dry iron. 8. Place the black fabric on the ironing board and began order the picture. the black fabric's top on the proper place beginning from the corner. Place next piece keep in mind to leave black line between them. If needed reposition the pieces till you are satisfied with the look. Tip: If needed use a dry glue stick for easy order. 9. Fuse with hot iron carefully. 10. 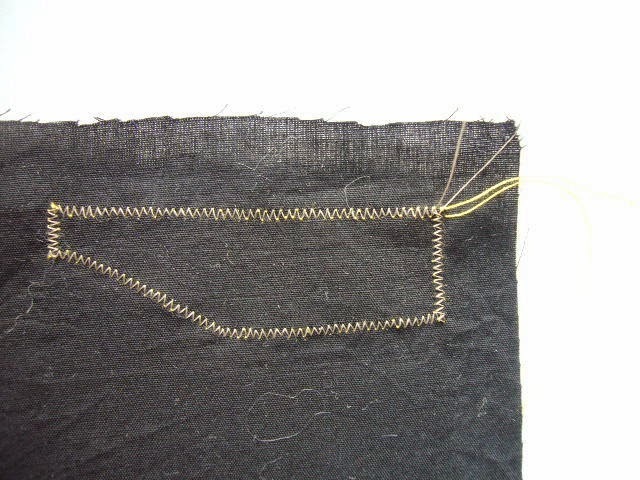 Using zig-zag stitch sew along the edges of all pieces with suitable threads. Tip: You could use one and the same thread in the bobbin - simply loose the tension of the upper thread. To prevent bulk of threads I end the stitching close to the beginning, pull the threads on the back side and make a knot to secure them. 11. Proceed the same way with all pieces. Tip: Use the foot for application. When finished you can use this block as you like - for coaster, for cushion or wall hanging if enlarge. I have designed some different pictures. Grab them from ETSY or CRAFTSY. I will be glad to see the finished blocks.